Tags: Recording and Mixing in Adobe Audition, Snare drum production techniques. Step1.) You need to setup the drums properly. Make sure that the drums are tuned (for example snare and kick) and ensure that all microphones are fully working as well as the cables. 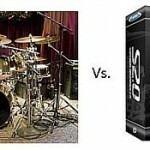 If you have the drummer in the studio, let him play it and adjust so that it will have an optimal tone. 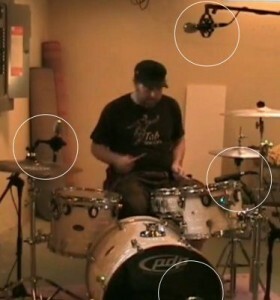 Bear in mind that the room and acoustics in your studio can play a great role on the resulting sound of the drums. Of course, if the drummer is not hitting enough then the captured recording will be weak. This does not mean that the drummer should be overly aggressive as this can damage the drum in the long run. The key is to adjust the mixer settings and the recording level so that it will have a well recorded sound. a.) SM57 for Snare drums. b. )A mic with good low frequency response for kick drums such as AKG-D112. c.) Two Cascade Fat head Short ribbon microphone for overheads. 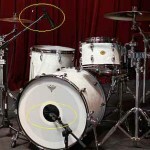 Snare: Put some 2 inches allowance from SM57 from edge of the snare at 45 degrees angle. Kick drum: A good tip is to place the microphone inside the kick drum by removing the drum head, then put some blanket over it. Overhead 1 -(near tom) – start positioning at 3 to 6 inches. 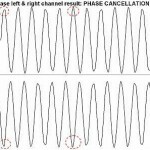 experiment for best sound. Overhead 2 -should be at the center of the drums between left and right cymbals pointing downward, tweak this for best sound.